No matter how perfectly you design your email, it is a waste of time if the email is delivered to the spam folder where your subscribers won't see it. This unenviable fate awaited one out of five marketing emails sent this year. So, it’s your task as an email marketer to improve Inbox deliverability and performance of your overall email campaign. According to the email deliverability study conducted by Return Path, global email deliverability rates have dropped from 83% last year to 79% in 2015. This means for every five emails sent, one never reached the intended recipient. Instead, it's either sent to a spam folder or goes missing — most likely blocked by the mailbox provider. So for helping you succeed in email marketing, I'd like to give some advice on how to keep your emails out of the spam folder, improve Inbox deliverability and get more opens and clicks. I'll also share a live email deliverability test with you so that you can instantly check where your email lands: in the Inbox or spam box. 1 Deliverability Obstacles: What Prevents Your Email from Going to Inbox. 2 Deliverability Solutions: How to Improve Your Inbox Placements. 3 Deliverability Insights: What Industry Experts Tell about Inbox Placement. 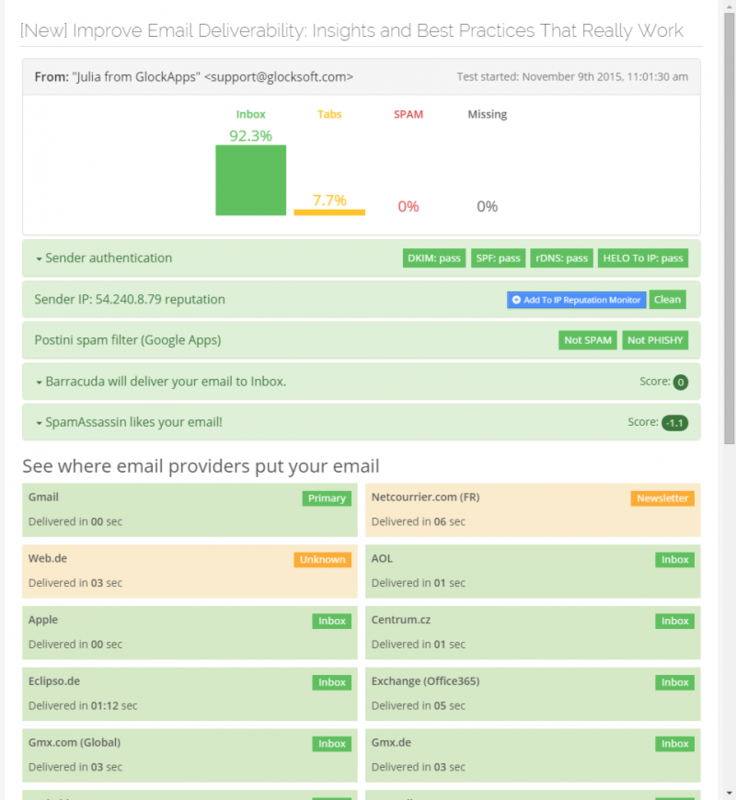 4 Deliverability Test: Measure Your Inbox and Spam Rate in Real Time. The first step toward fixing deliverability is understanding what factors influence deliverability and email placement. These three elements are considered by the Internet service providers (ISP) to measure the reputation of a particular sender and take the decision about the email messages sent by that particular sender. The recipient's engagement is considered as the aggregate of actions users take on the messages received from a sender. Positive actions such as opens, clicks, replies, moving the email from spam to Inbox, adding the sender to the address book favor the reputation and, consequently, Inbox delivery. Obviously, negative actions like deleting the email without opening, ignoring it, moving it from Inbox to spam, sending a complaint or unsubscribing factor negatively into how ISP and mailbox providers treat the sender and his emails. Moreover, a few of the top mailbox providers like Gmail and Yahoo have adopted a personalized approach to the delivery of emails to each user based on how the user engages with a particular sender. Thus, the more positively someone acts on your emails, the more likely your messages are delivered to the Inbox for that person. The second biggest obstacle to Inbox deliverability last year was recipient's complaints. The old good "report spam" button allows email users to quickly notify their mailbox provider or Internet service provider how they treat a particular sender and his email. Every time a recipient marks an email as spam, the sender reputation goes down a little bit. Big email service providers like MailChimp, GetResponse or ConstantContact and delivery services like Amazon SES are signed up for feedback loops with major ISP to watch complaints about their clients' mailing activity. To provide a good deliverability to all their clients, they have a low threshold for complaint rate from each email campaign and penalize unscrupulous senders by suspending their account. Let's consider the third factor leading to low reputation and deliverability that is low mailbox usage. To apply the spam-filtering algorithm appropriately, mailbox providers also look at how many "half-dead" email addresses marketers are emailing to. Low mailbox usage is different from low engagement. Low engagement means that the user often checks mail in his mailbox but rarely opens emails, clicks links, replies, etc. Low mailbox usage means that while the user's account exists and can accept mail, the user rarely logs in and rarely reads mail or does anything else with emails. If a marketer has a lot of "half-dead" email addresses on the list and continues mailing to them, it's a sign for mailbox providers that the marketer does not manage his properly and may be a spammer. Now that you understand the main factors that lead to a drop in deliverability, you can move on and re-work your email marketing campaigns to address the issues and improve Inbox deliverability. Some email marketing experts recommend removing inactive recipients immediately, but we think it can be considered as the last measure if nothing else works. There are other things that you can try to re-engage the recipients before blindly removing them. Subject line. Sometimes changing the Subject line helps wake up the recipient's interest. Try something new, maybe cocky, daring that you've never used before. Add a deadline or urgency to the Subject to push them open the email now and not shelve it. Split your list into 2-3 groups and send the same copy but with different Subjects to small groups. Check your open rate for each group to see which Subject performed better. "From" line. Testing a different "From" line is also helpful. You can use a more creative "From" field. For example, instead just showing your email address or company name, you could set it to show your name and company name like "Julia from Glocksoft". Again, it's a good idea to do a split test to see if changing the "From" field has any impact on the open rate. Sending time. There is no general rule about the best sending time. Each marketer should experiment and find the best sending time himself. If you're tracking your open rate, you can check the statistics for past campaigns and see what time your open rate was the highest. Most people open the email within the first hour of being received. If you are sending when your recipients are not able to check mail, the likelihood of them opening your message decreases significantly. The first step to handling complaints is to understand why your emails lead to complaints. Analyze what types of subscribers and content generated complaints. See if complaining subscribers have anything in common. Are they coming from a specific subscription list? Are they old or new subscribers? Are they also your customers? Are they from a specific country? If you find any touchpoint, you can try to set up a new mailing strategy for that subset of people and separate from your main program. In addition to the type of subscriber, the content may be the issue. Are people most complaining about your promotional emails, newsletters, blog updates? If a specific type of content generates the majority of complaints, consider re-writing it and presenting it from a different angle. Also, make sure that the content is relevant to what those people subscribed. Think of your sending frequency. Sometimes, a low or high frequency can lead to spam complaints. When it comes to how often you should send, the rule is to follow the subscriber's expectations. If you promised to send daily news and they agreed to receive daily newsletters from you by subscribing to your list, don't be afraid to knock their door every day. If you promised a weekly newsletter, then sending every day would be considered as spamming them. If you did not set any expectations regarding frequency, it is assumed that sending once a week is good enough. What is also important about sending frequency is being consistent with your email campaigns. Sending plenty of emails after a long period of inactivity is considered by mailbox providers as spamming. However, if you need to email to your list after a long break, take the time to validate it first for possible "dead" addresses, then split the remaining valid list into smaller lists and start sending slowly in order not to raise a red flag with ISP. The majority of inactive mailboxes are secondary email addresses that people use to subscribe to different mailing lists to protect their primary email accounts. Inactive mailboxes may also be disposable accounts created by people with the purpose of using them to opt-in. Those people are not willing to receive mailings and subscribe only to get some free stuff. Mailbox providers now use a filtering technology based on the recipient engagement. And if you are repeatedly sending to users who do nothing with your messages, it negatively impacts your overall reputation and deliverability. Thus, after identifying inactive mailboxes, you should separate them from your main list and send a re-subscription campaign to those users. If they don't re-subscribe, you should stop sending marketing emails to those recipients. If you don't want to lose those users forever, you can try to reach them via other channels like social networks and try to re-engage them. We've just considered email deliverability from the point of view of email marketers. In this chapter, I want to summarize the thoughts about deliverability and Inbox placement of the key email program personnel from big mailbox providers. Does engagement impact Inbox placement? Is authentication as important as we used to think? Does the Subject line matter as before? Do inactive subscribers spoil your reputation? How to improve Inbox deliverability? Read on to learn insights on the above things given by Paul Rock from AOL, Matt Moleski from Comcast, Sri Somanchi from Google, and John Scarrow from Microsoft. All experts said that the Inbox is different for each user. As a sender, you may have a good reputation, but your messages may still land in the spam folders of some users. This happens because those users have demonstrated, through their actions, that your messages are not relevant to them. So, the Inbox is not a global concept anymore. Deliverability has become personalized based on user behavior. Filtering decisions are made based on a number of "signals". All experts agreed that the signals of Inbox engagement play the most important role in determining how relevant the email to a specific recipient is. Since replying to emails is a positive signal that ultimately improves a sender's reputation, you'll want to make your "From" addresses accept replies, and probably respond back to the subscriber. Having a conversation with your recipients is a very positive signal when calculating reputation. All four experts said that email authentication such as DKIM, SPF, rDNS records, valid sending and reply email addresses are expected. If you don't have them now, take the time to implement. Some marketers start caring about their list only after deliverability problems happen. But that's too late. List hygiene should be a part of your email program from the beginning. Subscription, feedback loops, working unsubscribe mechanisms, and bounce handling should go without saying. Neither of four mailbox providers we're talking about pays attention to the subject lines. For filtering systems, subject lines don't matter anymore: not size, not content, not special characters, nothing. They are not looking at subject lines at all. But for the recipient, the subject line may still make a difference. If a subject line triggers a negative signal mentioned above, it impacts Inbox placement for that recipient. If it's large scale, there could be global issues. Like subject lines, personalization does not matter for the mailbox providers. But if a wrong or not working personalization like "Dear %%First_Name%%" triggers a negative signal from a recipient, this will impact an email placement decision for that recipient. All mailbox providers' representatives confirmed that blacklists do matter and are being used. Paul Rock from AOL said they have their own internal blacklist. If a sender lands on their blacklist, he is automatically blocked and the only way to be removed is to personally contact the AOL abuse desk. The fact the sender is listed on other blacklists is considered as one of the signals used in the overall sender's reputation calculation. It's true for Google, Microsoft, and Comcast. Matt Moleski from Comcast added that they also work with Cloudmark and a listing there should be handled through the standard removal request. Should you get rid of recipients that have been inactive for 12 months or more? John Scarrow from Outlook.com said no because they do not directly affect your reputation. He clarified that the only way these inactive subscribers could hurt your sender reputation is if they flag your email as spam. Comcast and Google representatives agreed with John. However, Paul Rock from AOL said that if you're sending to inactive users repeatedly, you'll have problems with Inbox placement. Paul Rock from AOL indicated that they suspend email accounts after a time of inactivity (no specific timeframe was given). And they used to turn dead accounts unable to receive mail for one or more, sometimes multiple years, into spam traps. At Microsoft, inactive accounts that are not logged in to go away after two years. They are not turned into spam traps according to John Scarrow. Matt Moleski said that Comcast has various levels for account suspensions and inactivity. In general, when someone cancels their service, the account becomes inactive within 90 days. These accounts are not re-used as SPAM traps. According to Sri Somanchi, Google does not recycle or re-use abandoned accounts for anything. The representatives of all four mailbox providers agreed that they watch the volume of emails sent from every new IP address. The sending IP warming and ramping up remain topical. – If you're sending daily, switch to one email per week. – If you're sending weekly, switch to one to two emails per month. – If you are not seeing any recipient's activity after about three to six months, send a final re-subscription campaign asking if the recipient still wants to stay on your list. If they don't respond to this, stop emailing them altogether. Right list acquisition: permission based is the best practice, and he prefers confirmed opt-in vs. single opt-in. Right engagement: understand your recipients, send relevant emails to each recipient to make sure they are responding positively. Right measurement: use email analytics and track the recipient's engagement. Right opt-out: make sure that recipients can easily unsubscribe from your list. Don't forget about other sources of opt-outs (reply-to, [email protected], etc.). Right placement: don't try to "game the system" and get promotional emails into the Gmail's Primary Tab. This is generally viewed as disruptive behavior. Do you know if your e-mails are reaching the Inbox? When it comes to deliverability, it's important to differentiate Inbox placement and spam box placement. In both cases, we can say that the email is delivered, but… it makes a big difference, right? Thus, when your email service provider is reporting 100% deliverability, you should take its word for it as it may be 75% Inbox placements and 25% spam placements. It means that 25% of your recipients may not see your email at all. With time, your spam placement rate may increase and prevent most of your emails from reaching your subscribers that can lead to lost revenue. That's why it's important that you pay attention to the signs that can indicate that something goes wrong with your deliverability such as a drop in your open rate, complaints from your subscribers about receiving your emails in the spam or junk folder, complaints from your subscribers about not receiving your emails at all. If any of the above things happens, it's time to test your deliverability. The sooner you start doing it, the sooner you will discover and fix the issues and will be able to send further email campaigns to the subscribers' Inboxes. Here is when email delivery testing tools like G-Lock Apps come into play. G-Lock Apps gives you the most accurate and comprehensive real-time delivery reports showing your Inbox and spam folder placements. Plus, with G-Lock Apps, you can verify the sender authentication such as DKIM and SPF, check the email against spam filters, monitor your IP address reputation, and track email delivery duration. These valuable email deliverability reports will help you determine and fix possible problems to land in the recipient's Inbox and improve Inbox deliverability of all your campaigns. So check where your email appears (Inbox or Spam) right now! As mailbox providers use the more personalized approach to email filtering, delivering mail to subscribers' Inboxes in 2016 may be easier if you focus on the customer experience and engagement. Engagement is the measure of how valuable the content you bring to your subscriber's Inbox is. So, remember that not all your subscribers are the same and keep your messages relevant. Plus, if you adopt email deliverability testing and make it a part of your email marketing program, you'll be able to uncover deliverability issues and fix them before it's too late. Thus, you'll have no problem with landing in the recipients' Inboxes and getting more opens and clicks. I’m pretty happy to know your thoughts about this article. Please share your views, complaints and suggestions in the comment form below. P.S Please, can you favour me to spread out this post among brilliant bloggers like you? If you enjoyed reading this post and think it’s informative, helpful and your friends also will like to read, please share it with your friends on any social network. Thanks for your support. I really appreciate it.